Very few details have emerged about the coup, as the government has tried to keep a tight lid on information. What we do know, however, raises a great number of suspicions. The economic crisis has its origin in pre-existing pathologies inside the political system over the last three decades so that a true recovery will require much more than wise economic management. 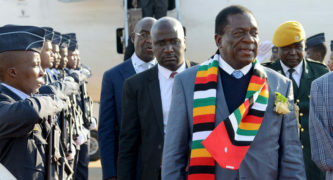 The Zimbabwe ConCourt decision to uphold Mnangagwa’s 30 July 2018 presidential election victory challenged by leading contender, Nelson Chamisa, has led to the question: ‘was the court partisan’? Coupled with the unusually fraught political tension in the election run-up, this recent violence is cause for concern. Addressing these issues now could be vital in preventing violence in the future. When the coup is reconciled with historic civil-military relations and the events immediately preceding the coup, what emerges is military action in Zimbabwe in 2017 that further weakened the country’s already frail democracy. It is difficult to ascertain who between Mnangagwa and Chamisa is going to win. However, reading the mood in recent weeks, it might not be surprising if Chamisa seals a win in the first round of the presidential election. The first round of the presidential election will be held on 30 July. If there is no presidential candidate that is able attain 50 percent plus one vote, the second round is planned for September 8. Can adopting a new constitution lead to better democracy? Three such scholars, Todd A. Eisenstadt, A Carl LeVan and Tofigh Maboudi, recently explored this question in their global study of 138 constitutions from a 37 year period.